In celebration of 35 years as a touring company, Trinity Laban’s flagship company presents three brand new works. Celebrating its 35th year of touring, Transitions Dance Company returns for its 2018 tour to showcase the next generation of contemporary dance performers in a brand new triple bill of specially commissioned works. Award-winning Israeli choreographer, Hagit Yakira, presents The Ar/ct of Moving Forward. The simple yet mesmerising piece for the full company is about the literal and poetic act of forward movement, travelling, and time. It is performed to an original score composed by long-term collaborator Sabio Janiak. In his work for eight performers, When running starts and stops, British choreographer Richard Chappell combines classical ballet and martial arts influences to manifest relevant themes of community, fear, violence, and migration in a full-bodied, animalistic physicality. The moving work is amplified by Albert Dean’s sound score. Lovers is Jarkko Partanen’s first collaboration with Transitions and is an exploration of connection, commonality, and individual expression. The renowned Finnish choreographer organises the performers in such a way as to allow them to act, understand, and continue only through touch. The hypnotic work is at times bizarre, comic, and poignant. The dancers themselves are fourteen superb international young artists at the start of their stellar careers. The individuality and flair of these performers and the creative artistry of the choreographers make this year’s tour unmissable. Since its beginnings in 1982 – founded by original Martha Graham Dance Company member Bonnie Bird – this pioneering company has aimed to bridge the gap between training and a professional performance career for graduate dancers. 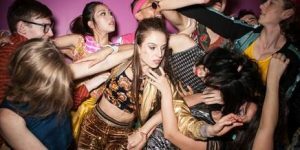 Transitions Dance Company allows company members to gain practical experience of life in a touring dance company whilst simultaneously completing their MA at Trinity Laban. Alumni include Sir Matthew Bourne (New Adventures), Luca Silvestrini (Luca Silvestrini’s Protein), and Emma Gladstone (Dance Umbrella).